But it isn't "plain old furniture." Every bit of furniture in every classroom, along with every light-fixture, every bit of wall, floor, and ceiling covering, every window, the room shape itself, the hall outside... these are all educational decisions which we have made, and like every educational decision we make, these enable some and disable others, favor some and damage others, and help to create specific educational outcomes. The classroom did not "just happen." In fact, it was quite directly designed. In 1832 William Alcott (yes, of those Alcotts) began a campaign to re-design the American schoolroom. He wanted to replace benches and long tables with individual desks and chairs with backs. He wanted a certain amount of windows providing a certain quality of light. In the early 1840s he became the leading proponent of the biggest changes in classroom technology, introducing teachers to the idea of using the new "chalkboard" and having the students use handheld slates because it allowed them to try writing, and to make mistakes, without wasting precious paper. He was quite specific. In one article he discussed the feelings of some that, for maximum flexibility, at least one whole classroom wall should be painted as a chalkboard. But he warned against this, suggesting that would be "too distracting," and that it would be better if a neutral wall color was used "above and below the chalkboard in order to focus attention." Are you reading this in school? Look around? See any changes? Later in the 1840s Henry Barnard joined in, basically designing the American multi-classroom school in his book School Architecture (download and read away my friends). These educational reformers were responding to very specific ideas of education at a very specific moment in time, as the United States attempted convert a large group of foreign-language speaking Catholic immigrants into Protestant thinking Americans who could begin to work effectively in the ever enlarging mills which were just starting to make America a nation which could largely depend on its own manufacture. These ideas were not aimed at the children of the nation's elite, who continued to either be privately tutored or to attend English style private academies, thus the architecture was not aimed at creating leaders or a creative class. Instead they were heavily influenced by the design language of the Protestant churches of America. Barnard's exteriors might suggest Catholic cathedrals, but inside the walls were straight (and usually white), the distractions minimal, movement limited, and all attention directed straight ahead. So, what we often consider "natural," or "unquestionable," was once a decision based on pedagogical assumptions. 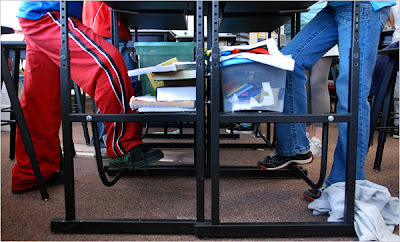 It is not “plain old furniture," it is a designed learning environment. So, should children sit in chairs to learn? Alcott thought so, but most kids I know would rather be standing or on the floor, depending on mood and task. Should display systems cover the walls? Alcott thought not, but lots of museums are starting to think differently. Should students file into school hallways so that they know they are 'in control'? Barnard thought so, though some school designers in the 1950s (and Californians) thought students might enter classrooms directly from outside. Should classrooms have uniform lighting? Early 20th Century school designers believed this, though most other interior environments show an understanding of the value of letting the human eye shift from dimmer to brighter and back fairly often. I was once invited to speak to a class of high school students with learning, attention, and emotional "issues." We met in one of the school's Special Education rooms. Overhead ancient fluorescent lights flickered and buzzed. There were no windows. Instead every wall surface was covered with what seemed liked thousands of pictures and blocks of text in a hundred different fonts. 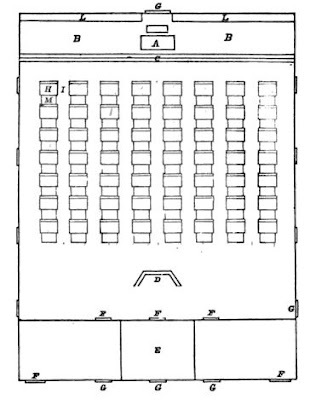 The seats were in rows, but placed so that one group of students faced the side of the other students. Therewere four computers and and a television set. The TV was on, the computer screens all flashed multi-colored moving screen savers. "I just can't get their attention, they are all crazy ADHD," the teacher confided. Outside that classroom the sounds of the cafeteria and slamming lockers echoed through uncarpeted, hard-surfaced corridors. The paint was old, the lighting grim. Further outside the building was an uninspiring series of brick blocks, surrounded by fencing and guard shacks at parking lot entries. Creative grafitti at one of those entry points had converted "West BlahBlah High School" to "West BlahBlah Correctional Center." Now, I don't want the schools Henry Barnard wanted, but he was right: Everything about your school impacts your students - from when they approach the grounds to how they enter the building. From how they get to their locker to where they sit and eat lunch. From the light in your classroom to the desk to the carpet or lack of it. The sounds, the windows, the schedule - the fencing, the trees, the PA announcements. Everything about your schools impacts the students and helps to decide which students succeed and which students fail. I am an absolute believer in classroom technology, you who read me know that, but remember, the first technology, the biggest technology, is the classroom itself, the school building itself. When we think of technology solutions, perhaps we need to start right there. I never really considered this Ira, but it is so true - it it everything. When you walk into a school and/or a classroom you can sense a culture immediately based on the environment, the design. Thanks for the background info. The context puts it in perspective - frustrating how things get stuck in what has always been...just because. Many of us are trying to design learning experiences that are more accessible for all learners - are we considering the environment? Unfortunate how a certain subgroup of students are continuously disadvantaged as a result. It is all part of creating accessible learning environments. I tried to get my school to buy me some adjustable desks this year. Of course they cited budget but I think they thought the idea was just too weird. I have noticed that some classrooms 'work' better than others, and have some ideas about why. I found your information about the history of classroom design truly informative. Thank you for sharing it.